We often hear the words 'All good things must come to an end'. In this particular case, it is not only true but is a bit sad as well. It is time to say goodbye to these old friends and their band of the past 43 years. Hazel and Herman "Mac" McGee and their bluegrass band White Mountain Bluegrass [WMB] are two such old friends to countless fans and friends on the European continent. New England bluegrass pioneer Joe Val recommended the band to Rienk Janssen, EBMA / IBMA board member and owner of 'Strictly Country' (a source of music recordings and more based in the Netherlands). Rienk first brought WMB to Europe in the late 1970s. For a total of 8 tours in Europe, White Mountain Bluegrass consistently filled the venues where they performed: house concerts, cafes/pubs, halls, theaters and festivals. They have proven to be one of the most requested and popular American bluegrass artists to perform in Europe. Hazel and Mac first met each other in the mid-1950s (neither of them are exactly sure, but both agree it was "probably in 1955"). They began playing music and singing together at that time. They married in 1957. A loving relationship ensued and has held true for the past 60+ years. Imagine having the same singing partner for 60 years, through good times and bad; raising a family, keeping a full-time job and maintaining a working band for all those years. That has been the hard yet rewarding path followed by Hazel and Mac McGee. The McGee's started the White Mountain Bluegrass band in 1970. 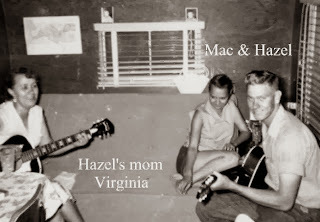 Their son Herman, Jr joined Hazel and Mac as the banjo/guitar player and baritone singer in 1973. Another long-time band member is resophonic guitarist Roger Williams. Roger, a familiar face to bluegrass fans in Europe, first joined WMB onstage in 1978 and has performed with WMB for much of their 40 year history. Of course, there have been several other band members but Hazel, Mac, Herman and Roger were the core unit of White Mountain Bluegrass for decades. Hazel and Mac McGee have had their names added to the International Bluegrass Music Museum's "Pioneers of Bluegrass" plaque in Owensboro, Kentucky, USA. They are most deserved of such an honor, as are those who join them on that elite list of less than 80 names. White Mountain Bluegrass made their final European appearance in May 2011 at the "Strictly Country Reunion Farewell Festival" in Emmen, NL. The event celebrated Rienk Janssen's retirement of his Strictly Country Magazine after 40 years of bi-monthly publications. Hazel and Mac McGee have now officially retired the band after 43 years. They have both had their aches and pains, and entertained the thought of retiring from music for many years. Finally the time has come for them to let the band go and enjoy a welcomed rest. I am certain all their friends and colleagues throughout Europe would like to shake their hands one last time, and wish them all the best in their most deserved retirement. Since that is not possilble, perhaps all that is left for us to do now is thank them for their decades of love, dedication, support and perseverence in bluegrass music. Offer thanks for being such fine ambassadors and friends to all in bluegrass music. Thank You, Hazel and Mac McGee.